Introducing Property Genie, The Most Powerful Property Management software available today! Property Genie is built using Microsoft Smart Client Technology, a sophisticated development paradigm which eliminates the “browser” (i.e., Internet Explorer) from web-based applications. The smart client app is installed once on each PC, Net Book or Laptop and then updated automatically when new releases or service packs are available. This results in less traffic between the user and the hosted servers, faster system navigation and a more tolerant interface that does not drop data changes, like a browser would, when an Internet connection is temporarily interrupted (e.g. with sporadic wireless connectivity). While the technology excites the techies, our users focus on the features and benefits to their operation: Faster response times and more stable day to day use. 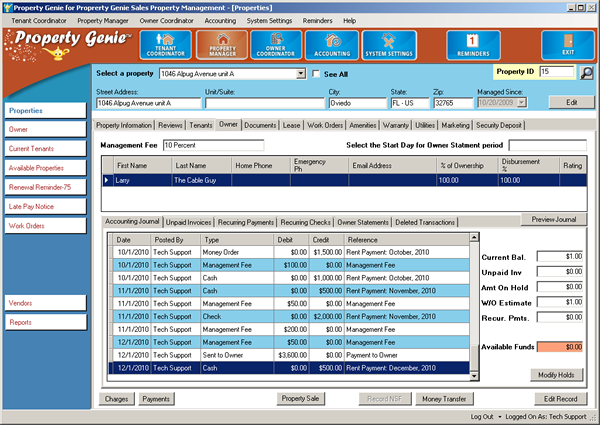 Property Genie Property Management software was designed by property managers for property managers! Property Genie is the best full featured residential property management software available on the market today. Best of all, The Property Genie software integrates with Quickbooks -- seamlessly. Eliminate wasted time from your operations! Property Genie automates the most time consuming tasks associated with property management, so you can manage more properties, in much less time. Plus, our software was designed with the NED2 philosophy, (Never Enter data twice!) so you won’t spend any time reentering data from one software to another. Put the data in one time, and it is in your Accounting, Outlook, website, and recordkeeping, reporting and Management systems all at once. The Property Genie Property Management Software was truly designed by property managers.